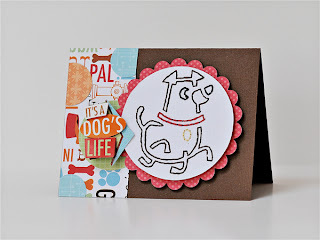 More "Scraplifted" Projects with Mimi and I plus a GIVEAWAY! - Pebbles, Inc. I really have enjoyed seeing everyone’s lifted LO’s. It is fun seeing everyone else’s take on each other’s work. I have a few techniques that I like. I like the squares on Eva’s. I love how Lady Grace layered the big scallop punched borders and the stitching from today’s post. Definitely on my list to do. I love today’s stitching technique and will most definitely be scraplifting that one! Thanks for all the ispiration!! I will be lifting Giuseppa’s beautiful way of showcasing the bits of patterned paper. I love it. I also have several of Lynn’s layouts saved to lift. Great inspiration from this blog! I love all of the DT cards and layouts. One of my favorites that I’m going to lift is LG’s Sweetie layout. I love what she did with the border punch. Thanks for all the wonderful inspiration! All of the projects have been gorgeous this week! I would like to lift Eva and Kristin’s layouts. I like the blocks because it is a great way to use scraps or to showcase favorite snips of paperlines. It also reminds me of the popular printer’s trays! Very cute! Gorgeous projects and fabulous lifts! I love that stitching and if I have time this weekend, I’m going to try it! I’d like to lift Eva’s Goodbye 2010 too. I love the alternating blocks of paper and embellishments and photos. I also love the clean lines of it. Stitching- I have all the tools and just don’t do it enough. It looks fabulou so I am definitely going to try. I think that stitched card has won me over! Something on my to-do-list, for sure! I love the sort of patchwork pattern that was used on several different projects this week, and I know exactly the pics I want to try it with !! I have been wanting to lift Ginger’s sunflowers and one of these days I’m going to do it! I’d love to win some new Pebbles goodies! I love LG’s layout. I really like the different papers behind the circles! I love the hand stiched cards today and will be scraplifting that idea! Very cute! I think the Tiny & Sweet layout will have to be scraplifted. It’s wonderful and delicate. I love the scalloped punch idea. It would be a fun one to “lift”. 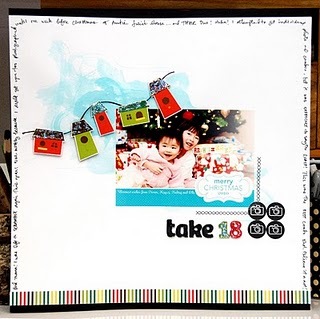 I want to scraplift LG’s layout with that beautiful punched border on the bottom. I just got that very punch and I can’t wait to copy her =). I wanna do everyone’s!!! I can’t terll you how many I have actually saved in my inspiration folder this week!! Have enjoyed these posts so much!!!! I love the border punch technique from LG Belarmino on Feb. 15th. So simple yet so effective!! I have lots of punches, and never feel like I use them up to their full potential! I’ll have to try this! Thanks!! Today’s stitching technique looks awesome!! I get so many ideas here! Today I’m inspired by the glittery snow letters and the stitching. I will scraplift Lynn’s for sure!! Love it. But all the works are so inspiring!!! I love scraplifting..really want to try the border with the paper backing the punched holes…and to make it easier…..I own that punch already, but would have never thought to use it that way. Thanks for the constant inspiration. I love the stitching technique! love the scraplifting. I want to try and do a small album. Maybe one is a shape album but am scraed to try one. We do to a scifi con on labor day weekend. I have so many pics from that trip. Would love to make a special little album just for it. But since it will be looked at alot I’d need some way to protect it. Love all the wonderful ideas. I’d like to scraplift the loops of paper off of Wendy Sue’s layout. Love the dimension it gives. I really want to start stitching on my cards and LO’s more than I do..thanks for sharing all of your great “lifted” ideas this week. I really like Belarmino’s yellow butterfly layout with the patching technique…I’ve thought about that but never tried it! The entire layout is beautiful! 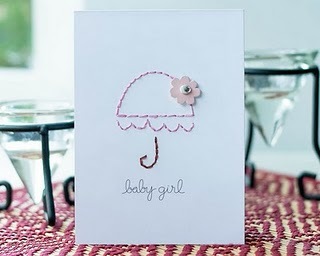 I DEFINITELY am going to lift that super cute baby card – that stitched umbrella is adorable! I love LG’s original LO. Using the scallop trim and then the different patterned papers behind. I really want to try that on a page. Scraplifting is where a lot of my inspiration comes from. I am loving the stitching & I really wanna try some of the misting I see happening. Thanks for the inspiration and the chances. I loved all the lifted layouts…my fave was the I love my kiddos one…loved all the squares and scallop border. I especially love your new line: Happy Go Lucky! Love the way LG & Wendy used pattern papers behind their punched scallop borders. It’s so simple but makes such a statement ! I love, love, love the colors on Deena’s adorable little box (http://pebblesinc.blogspot.com/2011/02/more-love-projects-with-deena-savitri.html) — I want to transfer those colors onto a card or a layout ASAP! I really love the look of the stitched squares on “Goodbye 2010”! I have had this on my want-to-try list for a couple of weeks now. I love that look! I’d like to try journaling around the edge of a page although I don’t like my handwriting. I like the stitching technique shown today using the chalk stencils–very cute. love the idea of stitching around a stencil! I love the simple patchwork patterns, using small pieces of patterned paper, based on a piece of white or kraft paper. It’s such a great way to use a lot of patterns, without the layout becoming overwhelming! I love how Mimi Leinbach added “snow” on her title and the snowflakes. I will definitely try that on my winter pages. Umm.. is there anything on the Pebbles blog I wouldn’t like to lift is probably a better question! I love everything the Pebbles designers come up with. I’d love to scraplift Savitri’s card as you have Lynn. Both great cards! I love the hand stiched cards today! I will be trying that! Thanks for all the amazing inspiring projects and for the chance to win. Funny that this is your question. I had just saved the linke of Eva’s Goodbye 2010 LO that was reposted on your last blog post because I want to do a recap of 2010 just like it. I hope to get to it today! I like Ginger and LG’s layouts. I’ve long wanted to try the journaling strips. Maybe this will be the inspiration to give it a try. Ive really liked all the projects you featured this week!! Evas Goodbye 2010 layout is in my “scraplift” pile as well as Jennifers Furry Friends!! Thanks for sharing and thanks for the chance to win!! Wendy Sue’s loops of paper on her LO has been on my list of “lift” ideas. That is why I come here daily – I get so many creative ideas! Thanks for the Pebbles prize pack chance. They are one of my absolute favorite companies! The scraplifted projects have been great. I really like the stitching technique and will most defintley be lifting(trying) that one. Thanks for the wonderful inspiration! I would love to use that stitching technique on my next project ! I love all the layouts but I definitely want to try Eva’s squares – what a great way to get lots of patterns without overwhelming the page! I really enjoyed these scraplifts this past week. I am always seeing layouts that I like and will scraplift them. I really liked the original Goodbye 2010 by Eva and Kristen’s lift of this layout. I love clean cut lines so this one was my favorite.